Welcome to Tony’s new site! Home » News» Welcome to Tony’s new site! Welcome to Tony’s new website! We’ve rebuilt the site completely with new content and photos. 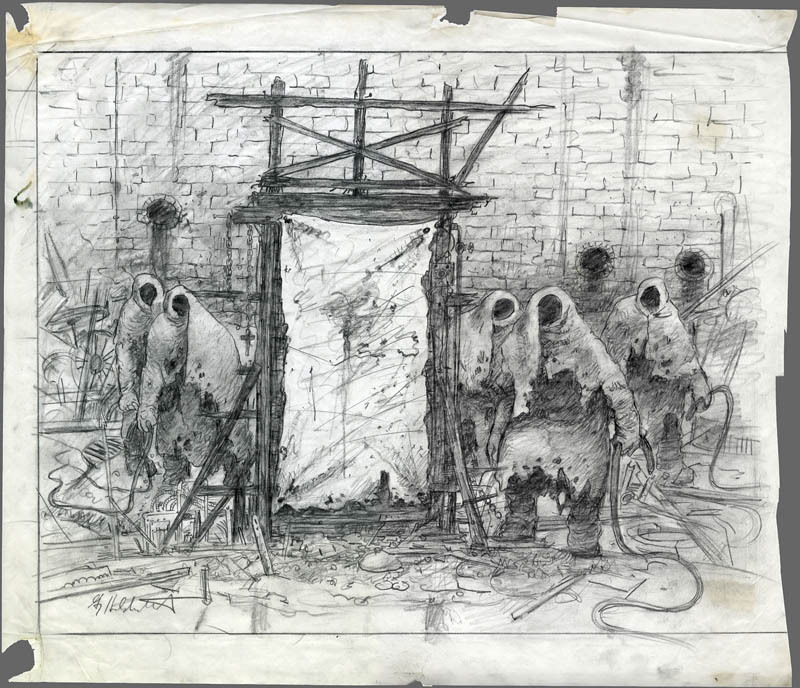 Every section from the old site has been updated, the highlight of which is a major new discography that will feature exclusive info, insights, and other thoughts from Tony that will be updated as part of an ongoing “Featured Album” column. The equipment area has been re-vamped with new photographs and includes many new guitars and the new stage rig. The site will be closely linked to Tony’s Facebook, Twitter, and Google+ sites, so if you are a user of those sites, make sure and visit us there, too! You can now leave feedback on Tony’s site, something you could not do before. Let us know what you think, and what you would like to see here. 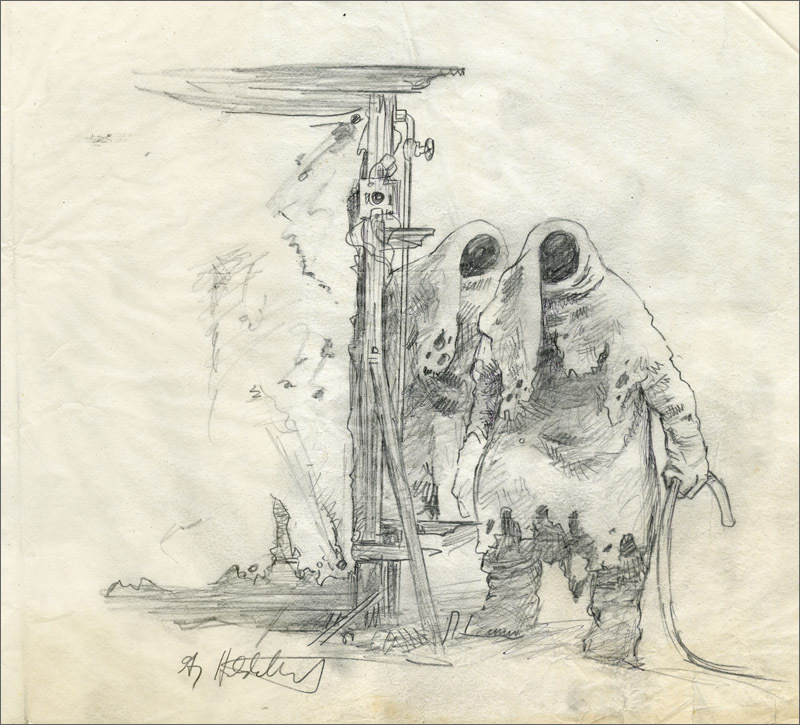 As a little bonus, here are two original pencil sketches of Greg Hildrebrandt’s “Mob Dream” artwork, later commissioned and used as the cover to the “Mob Rules” album. ThanksTony for all the great music and live shows.Looking forward to visiting your site to see new stuff. Any chance of adding video guitar lessons on it. Thank you for making music that has ment so much to me you are the reason I play guitar keep the riffs coming!!! and informative. Please make this the one stop site for all that is Tony Iommi. I’m tired of taking a lot of time searching the web and also getting a lot of wrong information. Dear Tony. Thanks for all the brilliant tunes and magnifiecent riff over the year. You have inspired thousands of asspiring musicians all over the world. Including myself and my band Shadowland. We’re 5 guys from Norway who are struggeling a bit to get our music heard. You would do us the greatest honour of all if you would care to check us out. Here is a link to a live performance: http://www.youtube.com/watch?v=zxA7P50141Q . Also I have added our facebook site. Thanks, and keep rocking!! Great version of a brand new website, very modern look and possibility to visualize on mobile devices. You deserve only the very best, dear Tony! So happy and proud for you! Lets look forward to the great future and many interesting and exciting things, like new music and new gigs and meetings! Lots of love to you, dearest Master! Rock on! TONY, THIS WEBSITE IS AS CLASSY AS YOU ARE, I LOVE THE LAYOUT AND I HOPE IN THE VERY NEAR FUTURE TO HAVE THE HONOR TO MEET UP WITH YOU AGAIN. AND LETS ROCK THE WORLD WITH BLACK SABBATH. Awesome. Love to meet you Mr. Iommi and long live Black Sabbath. Beautiful new site, Mr. Iommi! Your music enriches my life in so many ways! Thank you for the great music! Hope you and the guys from Sabbath tour and record another album soon! Just wanted to send you a note Tony to express my deep thanks for all the great memories you helped create and cement…. Tony, thanks for giving us years of some of the best, most influential music of all time. Everyone who listens to you will know why you are truly the Father of Heavy Metal. Everytime your close or in Calgary I’ve come to see you hopefully you come by on your next tour. Been a fan since 1970. Thanks for making the music shakes the world. I recently had a heart attack and when I was in the hospital, I have read the book “Iron Man” written by you. Well I have to say this book is great and so true and full of humor even when handling the most difficult moments. Thank you Tony for sharing your life. I think your family is very lucky to have you. I wish you all the best. The new site looks amazing! I am a huge fan of every era of Black Sabbath/Heaven and Hell. I think I have seen them over 20 times! I would like to see an extensive STORE. I would like to purchase classic signed Tony photos or signed items from Tony. I can’t stand these ebay scammers with all their COA’s and such. Take their business away…as consumers we have no idea it these so called items are legit. Why not take the power away from these folks and offer the real fans an opp. to get real signed items right from the man himself? This is a great idea. I would love to be able to buy authentic memorabilia through this website. dear mr. tony iommi , I have to say that your music has eternally influenced and saved my life in so many uncountable instances ! you have been my favorite guitarist since I was three years old ! I spent most of my teens years being inspired and looking up you your ability, as I was becoming a pretty good guitarist myself. and in my late twenties, my hands became disabled due to an early childhood neck injury and I thought that my life was so empty not being able to play for so many years. just doing my job was so hard and painful- I had to relearn in different fashions how to do everything not using my fingers in every aspect of my life. it was the hardest part of my life- and i was so terribly depressed for years. then one day after about ten years, i read an article about the prosthetic fingertips that you made for yourself and I became so enthralled that I started making myself practicie everyday, no matter the pain or frustration- I decided that I was on a mission to play again. so one morning, not so long ago ,I picked up my dusty guitar and I could hear ORCHID playing in my head – and I played it. most of it anyway. I had to check on YouTube for a few specifics ! anyhow I’m still rusty as hell- but have been so entirely inspired by you. I have even had the pleasure of seeing my own children , brothers and cousins play your music on their guitars. so – you also run in my family. i want to tell you that I appreciate your talent, ability and perseverance and how much it has inspired and driven me in my own time. i love you for that , and thankyou. i hope that you are not in pain and I can only imagine that you are among loved ones- and are satisfied. I don’t even know if you will actually get to read this- but somehow I just had to try to tell you that you changed this poor south carolina girl’s life forever the very first time I heard your music. I so wish I could shake your hand. I am wishing so much love and peace to you , mr iommi. It’s mick hull and mike gillan from the old bands in Carlisle in 60s. Square chexs and methnol. Meet mike gillan in November for cancer charity gig, mike hadn’t performed for 32 years. Very successful night which was sell out. Special guest appearance by mike Harrison of spooky Tooth. Hopefully going to another gig in summer. All the best tony, keep rocking. Mick.